As you all know I love wearing neutral looks and I have done several style features combining neutrals as it is how I dress most of the time. Wearing neutrals is a great option when you have no idea what to wear or how to combine colors. They are what I call a sure-bet color combo. So when in doubt, stick to a neutral color palette. One of the best parts about wearing neutrals is that you can mix different patterns and make it work without it looking busy. So for today’s look I have an easy yet stylish neutral look you can wear to the office or a fun weekend outing. I started off with our Jute Knit Hooded Cardigan which I first styled for you here. I love this cardigan because you can wear it casually or dress it up a bit and wear it to the office. It is made out of a textured jute yarn and it is very soft and cozy. The weight is perfect for a cardigan to wear for spring and even on cool summer nights. I combined this fun cardigan with our Coco Ivory Stripe V Neck T-shirt which is a great stripe tee for spring and summer. It is one of our many rayon jersey stripe t-shirts which are available in many other color combos in the store. They are a great staple for any woman’s wardrobe. The tan/ivory color combo is a great fresh choice for spring and summer. As you can see it looks perfect with the jute cardigan. We have just added a new scarf to our shop which works really well with this stripe top and the jute cardigan, because of its similar color combo. 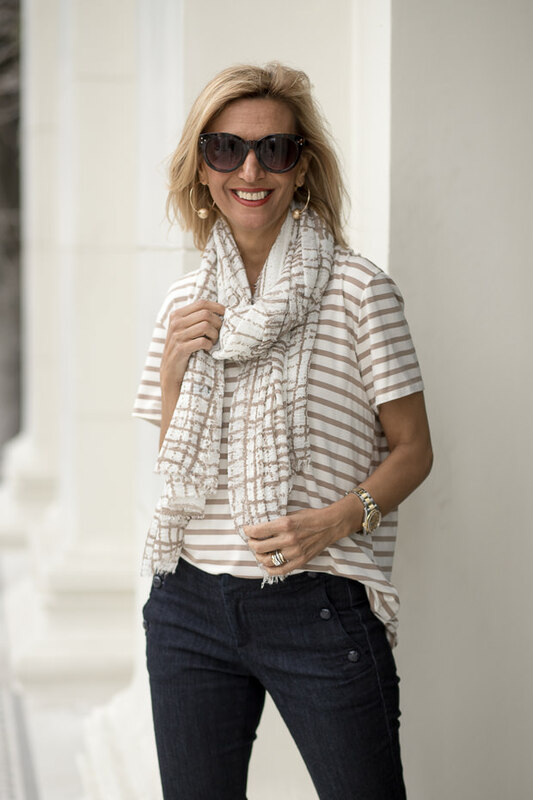 I am calling it our Taupe Ivory Gauze Grid Print Scarf. I think all the neutrals of the taupe/tan blend really nicely together with these three items. The scarf is printed on a soft viscose gauze fabric which is slightly crinkled. The weight and color combo are both perfect for spring and summer. As for jewelry today, I added a new earring from our shop. Our Gold Tone Hoop Earrings with Ball Slider. 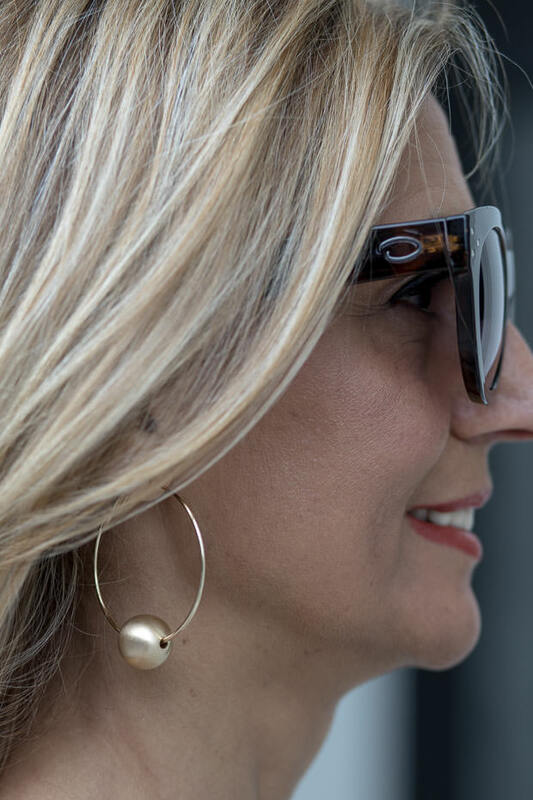 The earrings are a new take on the classic hoop earrings with a ball that slides and hangs from them. All four pieces I am showing you today are part of our Weekend Flash Sale where you can get 15% off each item when you enter code FS323 at check out plus you will get Free priority US Shipping. All international shipments are a flat rate of $25.00. That knitted cardi looks like the perfect layering piece for the Spring and it looks OH so soft! I love neutrals too!